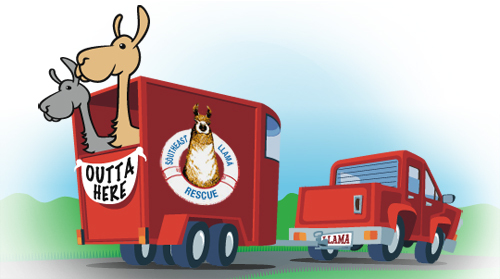 Register Your Rescue Llama for the Show Ring with ALSA! Find yourself west of the Missippi? Follow us on FB and see what the llamas and alpacas have been up to! Confused about who to speak to about our organization? Never fear we are here and looking forward to speaking with you, whatever your need. Our Adoption Coordinators list can put you in touch with someone in or near your state. We also offer our "Ask Annie" option where you can get in touch with Annie Higginbotham who will be happy to answer questions about medical or behavioral needs with the llamas you currently own. Ask any question you may have on our VERY active FACEBOOK page. The answer is that when things are going well, we have approved homes waiting so when we receive a surrendered animal, if they are a fit for what someone is looking for they are almost immediately routed to their new home. The Llamas and Alpacas are advertised on the web pages when we do not have adoptive homes waiting within a reasonable distance of where the animals were surrendered or are currently being fostered or they are not a match for applicants who have gone through the approval process and are currently waiting for just the "right one". The "right" one for you could be far different than for others, so get that application in to your state Coordinator so we can get the process rolling. You never know when your future llama or alpaca will turn up!! If you don't see a llama or alpaca fostered in your state, please check for animals available in neighboring states and be sure to contact your state Adoption Coordinator about animals which may be in the process of surrender or to help you with any questions you may have concerning the llamas or alpacas you see here.